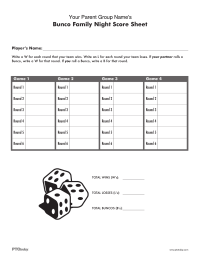 Grab a File:Bingo, Bunco, etc. For a cute and fun way to get to know your fellow volunteers better, print these "human bingo" sheets (10 versions available) and ask them to sign their names in the boxes that describe them. 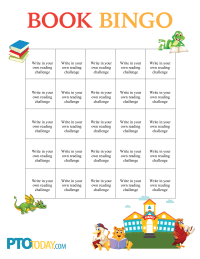 Fill in this simple template with your own reading challenges for a book bingo event. 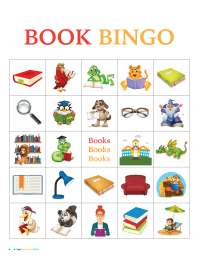 Cute sheets to use for a book bingo event for your parent group or school. 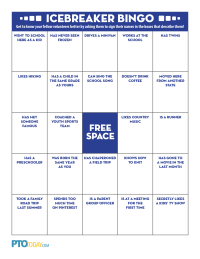 Downloadable bingo cards for your school's Turkey Bingo event! 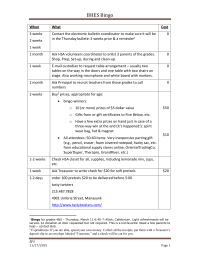 Print up to four different sheets. Turkey bingo is a fun way to get families together! 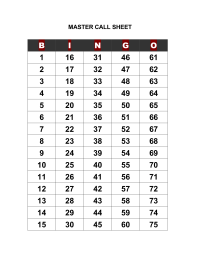 Use this editable file to promote a turkey bingo event for your group or school. 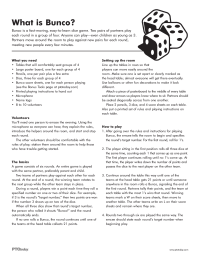 Instructions on how to plan and run a bingo event. This flyer/rsvp form announces a parents-only Euchre (card game) night held simultaneously with the student dance. 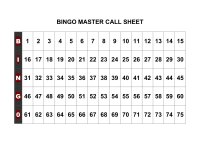 Reusable master call sheet for bingo games. 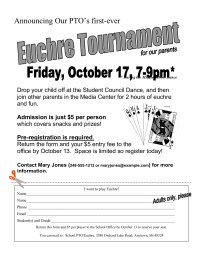 Score sheet to photocopy for use during the event. Playing instructions to photocopy for participants. 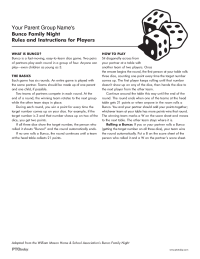 Planning instructions for Bunco Family Night.